Featuring; Terry McDermott, Bryan Keith, Amanda Brown, Melanie Martinez, Michaela Paige, Cassadee Pope, Trevin Hunte, Dez Duron, Sylvia Yacoub, Nicholas David, Cody Belew and Adrianna Louise. Only 10 artists remain in the competitions after tonight’s elimination. According to host Carson Daly, America casted more votes over last night’s stellar performances than in the finale of season 2. Before the first two artists who are safe from elimination were announced, the audiences were treated to a performance by coaches Christina Aguilera and Cee Lo Green with the world premiere of, “Make the World Move.” Christina channeled her “Lady Marmalade” days with a burlesque corset ensemble and showcased why she and Cee Lo are judges on The Voice. With the 12 artists lined up on stage, Host Carson daily announces the first two artists who are safe from elimination. During last night’s performance round, coach Adam said, “The right song at the right time is important on the show.” America agreed and voted New York rocker, Bryan Keith from team Adam into next week. Bryan’s rendition of Amy Winehouse’s “Back to Black,” showcased his soulful side and proved to be a hit. Next to move on were 19 year-old, Michigan native Sylvia Yacoub from team Christina. Sylvia’s cover of Celine Dion’s “My Heart Will Go On,” left judges un-opinionated last night with judges all agreeing it’s a hard song to execute. America must have empathized with Sylvia’s shaky start to the song and instead focused on her breakout performance at the end. Before the next 2 artists advancing to the next round was announced, contestants Bryan Keith and Dez Duron joined country star Jason Aldean on stage performing, “The Only Way I Know.” Jason who met Blake Shelton when they were both opening acts for Rascal Flats in 2006 gave both Bryan and Dez a well-deserved compliment by comparing them to fellow country singers Luke Bryan and Eric Church. 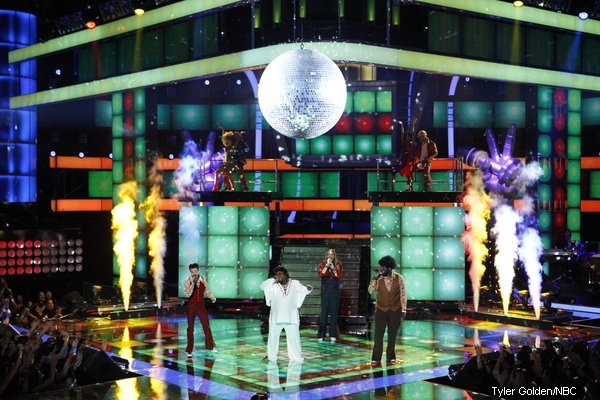 Cee-lo Green took to the stage along with his team performing the Bee Gee’s classic hit, “Staying Alive.” Cody Belew showed his disco moves while coach Cee-Lo jammed with Trevin Hunte and Nicholas David. It was a crowd pleaser and a solid performance from team Cee-Lo. The remaining artists joined team Cee Lo on stage as Carson Daly announced the next 2 advancing on. Turning to the coaches, Carson brought up the fact that none of Blake’s artists have been saved thus far tonight. The next artist to move on was 18 year-old, R&B singer Trevin Hunte from team Cee Lo. Trevin’s tribute to Percy Sledge and Michael Bolton with his cover of “When a Man Loves a Woman,” left coach Cee Lo in awe during last night’s performance round. Cee Lo told the soulful singer, “I’m humbled by your voice…I can’t do what you do. Your talent is immense.” Finally, Carson announced Cassadee Pope from team Blake can move onto next week. The pop/rock artist who put her own rocker spin on Kelly Clarkson’s “Behind These Hazel Eyes,” sang with conviction and made a lasting impression with coach Christina. America proved they felt the same by voting her into next week. Blake Shelton joins his team for the first time this season performing, “Life is a Highway.” Both Cassadee Pope and Michaela Paige did their best to entertain the crowd while coach Blake Shelton jams to his guitar. However, Scottish rocker Terry McDermott‘s powerful voice drowned out the rest of his teammates. With only five artists remaining, alternative singer Amanda Brown from team Adam is saved by America. Coach Adam wanted Amanda to scale back on the rock and roll attitude and showcase Florence + the Machine’s hit single “Spectrum.” Although Amanda was criticized by coaches Adam and Christina for not being perfect in her performance, America thought otherwise and voted her into the next round. The playing field at this point is leveled with 2 artists from each team moving into next week. Michaela Paige, Adriana Louise, Cody Belew and Melanie Martinez remain on stage. Coincidentally, the 4 artists saved by the coaches last week are the bottom four this week with only 2 to go forward in the competition. America decided to save Cody Belew from team Cee-lo. The larger than life personality turned on his diva mode to perform Tina Turner’s “The Best.” Cody confessed before his performance, “It’s pass or fail time. If it doesn’t happen, I go home,” The final artist to move onto the final 10 is the young, indie/folk songwriter, Melanie Martinez from team Adam. Melanie’s unique style in her rendition of “Cough Syrup” by Young and the Giant made a lasting impression with the coaches and America. 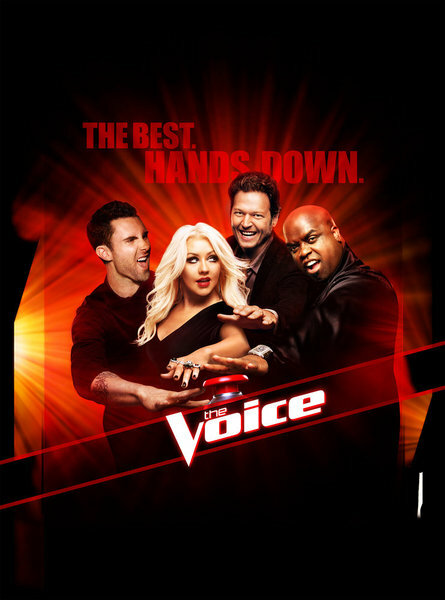 If you missed it or if you just want to see it again here you go – Watch Season 3 Episode 18 “B” THE VOICE Top 12 Elimination Results Enjoy!